I fly a lot for work. This means I have airline status (silver) with United. This gives me some perks. My absolute favorite is being able to use the “express” lane at airport security. It is *SO* awesome to not have to wait as long in line. I also get free bumps up to Economy Plus. It’s nice having that extra leg room and being toward the front of the plane. Being able to be one of the first off the plane is rather handy when your flight is running late and you’ve got a tight connection to make. 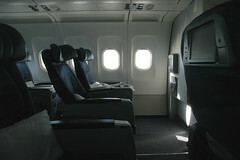 A few trips ago, though, I got bumped to First Class! It is *so* nice and cushy up there. The food is tasy and you get real dishes and silverware instead of plastic. Free alcohol too! Although I don’t usually drink on flights; it’s dehydrating enough being on a plane, I don’t want to worsen my jetlag by adding to it. This is how First Class works. A couple people actually *buy* first class tickets. But most just get a free upgrade for having status with the airline. The higher your status and the more miles/trips you’ve flown, the higher your name goes on the upgrade stand-by list. If there’s an open seat in first class and no one has higher status than you, that seat is yours! Also, it never hurts to just plain *ASK*. Before I even had any status, I was flying somewhere, and I just went up to the podium at the gate and asked the customer service rep there “what’s the deal with the upgrade list? how do you get on it?” I was just curious and looking for an answer, but she actually changed my seat to first class! I’ve tried it a few times since then, and now I’ll just ask “has first class checked in full?” So far, I haven’t gotten any other upgrades for just asking. So far this year I’ve already flown enough to secure my silver status for next year again. But I’m really hoping I fly enough to get gold status so I can get a bump up on the First Class stand-by list.